The Stanley Cup is the oldest trophy that professional athletes in North America compete to win. It was a donation in 1892 from Sir Frederick Arthur Stanley, Lord Stanley of Preston and son of the Earl of Derby. He wanted to present the trophy to “the championship hockey club of the Dominion of Canada.” The first team to ever win the Stanley Cup was the Montreal Amateur Athletic Association in 1893. In 1910, the National Hockey Association took possession of the Stanley Cup. Since then the trophy has been symbolic of professional hockey supremacy. Starting in 1926, only NHL teams have competed for the Cup. The Stanley Cup has changed shape several times. Tiered rings supporting the actual bowl were added periodically. Then in 1927, long narrow bands were added. These were later replaced by uneven bands in 1947. On those bands are the names of every member of the winning teams who have won the Stanley Cup. Over time, bands have been retired to make room for new champions. Retired bands, along with the original Stanley Cup bowl, are displayed in Lord Stanley’s Vault at the Hockey Hall of Fame. Each year once the trophy is presented to the NHL’s champions, the Cup goes on tour as each of the organization’s players and staff enjoy their own 24 hours with the Cup. To say that players have a special relationship with the Cup would be an understatement. In its many years of existence, the Stanley Cup has traveled around the world, including stays in Russia, Japan, and Switzerland as well as atop mountain peaks in the Rockies. In all of professional sports, no other trophy has the lore of the Stanley Cup. 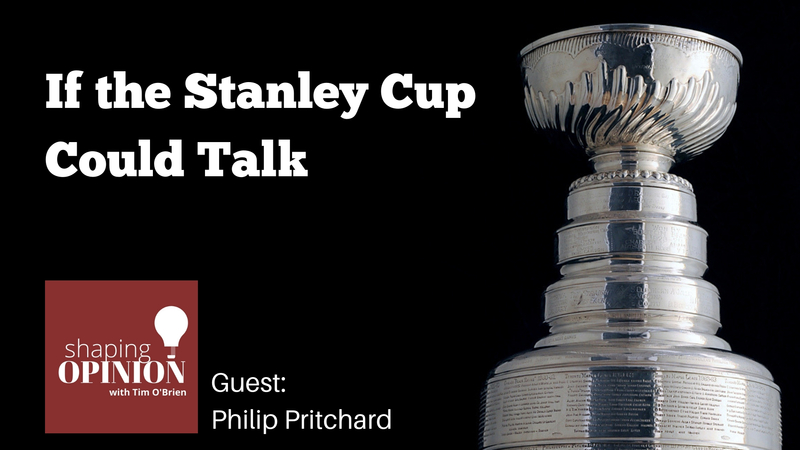 Philip Pritchard is curator at the Hockey Hall of Fame and is better known as the Keeper of the Cup. The Stanley Cup goes nowhere without Phil. The Stanley Cup Playoffs are four rounds of a best of seven series. There are 60 minutes in every game, and that is without overtime. Every shift a hockey player takes, especially in the playoffs, he’s giving 100% and more. They play with broken bones and other injuries willing to accept the pain in the hopes of winning the Cup. This after an 82-game regular season. Some players are wary of the Cup if they haven’t won it yet, and steer clear if they’re still in contention—in fact, some players on conference champion teams won’t even touch the respective Western Conference Campbell Bowl or Eastern Conference Prince of Wales Trophy so they don’t jinx their team’s chances at the real prize. Following their 1991 victory over the Minnesota North Stars, Pittsburgh Penguins legend Mario Lemieux hosted the team at his house. When Lemieux wasn’t looking, his teammate Phil Bourque decided he wanted to see if the Cup could float—and threw the trophy into Lemieux’s swimming pool. It didn’t float, and immediately sank to the bottom (thankfully, it was recovered unharmed). Two years later the Cup also found the bottom of Montreal Canadiens goaltender Patrick Roy’s pool. In 2002, Red Wings goaltender Dominik Hašek attempted to swim with the Cup. The Ottawa Hockey Club, now known as the Ottawa Senators, won the Cup in 1905, members had a little too much to drink and took the trophy outside and decided to test their accuracy by trying to kick the then-small Cup into Ottawa’s Rideau Canal. Once they achieved their goal, they went on their way and forgot about it—then they realized the next day that the trophy was missing. The Stanley Cup was retrieved and given to a player named Harry Smith, the most responsible man on the team, for safekeeping. When the members of the 1924 champion Canadiens got a flat tire on the way to the victory party, they had to remove the Cup from the trunk of a car to get to the spare tire to fix a flat tire. The players then made their way to the party. When the time came for each player to drink champagne from the Stanley Cup, it was nowhere to be found. The players had left it on the side of the road! They hopped in their car and sped back to the place where they had changed the flat and found the Cup in a snow bank on the side of the road where they had left it. After the Colorado Avalanche won the 1995-96 championship, one member of that team used his personal day with the Cup to have his daughter christened in the top bowl. To boost morale for Canadian and American troops serving in the Middle East, the Cup was flown in 2007 to an active war zone at Camp Nathan Smith in Kandahar, Afghanistan, for a meet and greet. There are more personal times for the players as well. Oftentimes, a player will take the Cup to the cemetery for a little bit. They often bring the trophy back to the people who helped them reach their hockey goal. Phil will leave them at the gates to the cemetery, and they take the Cup with them in private. Philip Pritchard is Curator at the Hockey Hall of Fame in Toronto and better known as the Keeper of the Cup.